Flow cytometric analysis of DLD-1 cells (blue) and HeLa cells (green) using β2-microglobulin (D8P1H) Rabbit mAb (PE Conjugate). 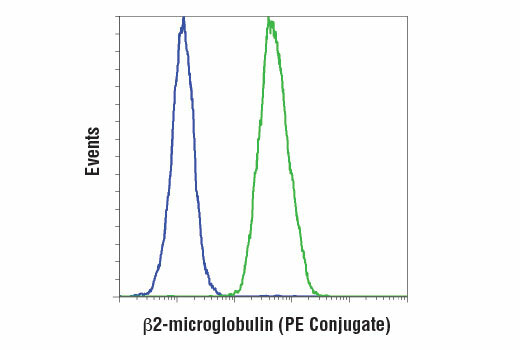 β2-microglobulin (D8P1H) Rabbit mAb recognizes endogenous levels of total β2-microglobulin protein. Monoclonal antibody is produced by immunizing animals with a synthetic peptide corresponding to residues surrounding Asp79 of human β2-microglobulin protein. This Cell Signaling Technology antibody is conjugated to phycoerythrin (PE) and tested in-house for direct flow cytometry analysis in human cells. The antibody is expected to exhibit the same species cross-reactivity as the unconjugated β2-microglobulin (D8P1H) Rabbit mAb #12851.
β2-microglobulin (B2M) is a principal component of the Major Histocompatibility Complex (MHC) class I molecule, a ternary membrane protein complex that displays fragments derived from proteolyzed cytosolic proteins on the surface of cells for recognition by the surveillance immune system (1,2). As an integral component of the MHC class I complex, β2-microglobulin plays a critically important role in immune system function (3). It has important relevance to cancer biology research; for example, research studies have shown that nearly one-third of diffuse large B cell lymphomas contain mutations that inactivate β2-microglobulin gene function, thereby allowing tumor cells to escape immune detection (4). In addition, β2-microglobulin has been identified as an amyloid preprotein with collagen-binding affinity (5); its accumulation in osteoarthritic lesions of long-term dialysis patients is reportedly a contributing factor to the condition known as amyloid osteoarthropathy (6). Krangel, M.S. et al. (1979) Cell 18, 979-91. Collins, E.J. et al. (1995) Proc Natl Acad Sci U S A 92, 1218-21. Marx, J.I. (1974) Science 185, 428-9. Challa-Malladi, M. et al. (2011) Cancer Cell 20, 728-40. Gorevic, P.D. et al. (1985) J Clin Invest 76, 2425-9. Ohashi, K. (2001) Pathol Int 51, 1-10.